With its multi-purpose 14 kHz operating frequency, this exceptional all-terrain metal detector is useful for all kinds of metal detecting: coin shooting, relic hunting, nugget hunting, searching for very deep treasures, beach hunting… you name it! Four preset discrimination programs: DISC ZERO, RELIC, COINS, BEACH. Available coils: Ultimate 7”, Ultimate 9″ and Ultimate 13” search coils. All search coils are fiber glass reinforced, ultralight, solidly built, waterproof and shock-resistant. Scratch resistant coil covers come standard with all coils. 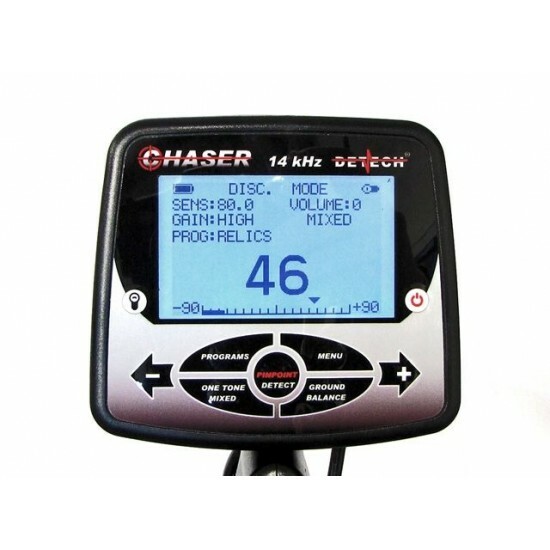 Please note: all the coils of the other 14 kHz Detech metal detectors (EDS Plus I/II, EDS Winner I/II, EDS Reacher 14 kHz) can also be used with the new Chaser 14 kHz and, in the same way, all the coils of the new Chaser 14 Khz can also be used with the previous 14 kHz Detech metal detectors. Real telescopic carbon fiber stem, ultralight and super strong! It allows a very precise adjustment of handle’s positioning. Its wide adjusting capability allows even very tall or very short users to comfortably operate the detector. Its maximum extended length is 1450 mm (57 inches). When collapsed for transporting, its length is 740 mm (29 inches). The detector uses 4 AA batteries providing more than 20 hours of continuous operation. The Chaser provides a 3.5 mm (1/8”) stereo headphones input. An excellently balanced detector, having the overall weight of only 1.5 kg (3.3 lbs) including the batteries and the Ultimate 9″ stock coil.